City Council is in the process of considering a change to the existing ordinance as it relates to the sale of alcohol in non-residential establishments. There has been some healthy debate on this topic, but the more debate I hear, the more I fear that most people do not understand what is really being considered. I also get the impression that even some council members do not understand this proposal. There are a handful of restaurants in Union that serve alcohol; the law allows that, and no one is considering changing that in any way. To hear people defend this new proposal, though, one would think those of us in opposition are trying to keep restaurants from serving beer. That is not the case. We are not pushing to become a dry city, nor are we trying to get restaurants to stop serving alcohol. The current law in Union forbids the operating of an establishment for the primary purpose of consuming alcohol; the proposal before Council would change that. If the ordinance is changed it would allow for bars to open within the city; nothing more, and nothing less. That is why I was shocked to hear council members at Tuesday’s meeting, saying that if we change this ordinance then we can get chained restaurants to come here. They already can, and it is mindboggling that Council doesn’t know that. 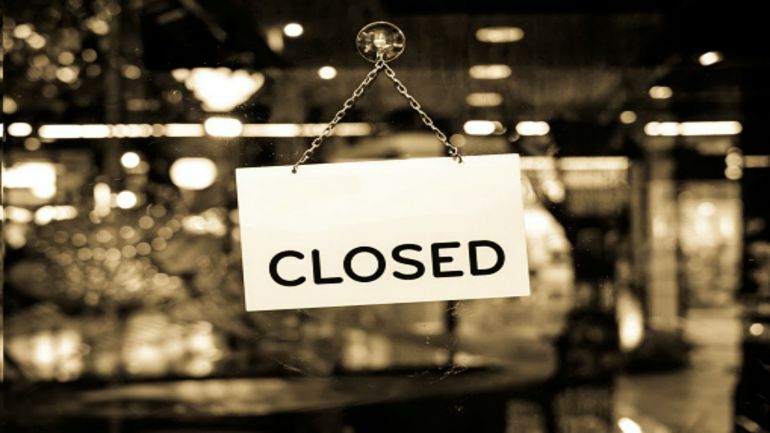 Restaurants operate for the primary purpose of serving food, and by law, can serve alcohol. Bars and taverns operate for the primary purpose of serving alcohol. After factoring in alcohol related homicide/suicide, falling and other accidents, drowning while under the influence, certain types of cancer, liver disease, other chronic illnesses, vehicular accidents, unintended pregnancies, birth defects, and alcohol dependence programs, Minnesota found out that they paid out $5.06 billion because of alcohol sales. In other words, they took an almost $5 billion loss. These numbers are admittedly state wide, not city wide, so the numbers aren’t comparable, but the concept is. Alcohol always costs more than it brings in. Alcohol always costs more than it is worth. Let’s not forget that South Carolina leads the nation in vehicular deaths on country roads. We also lead the nation in DUIs causing vehicular death and are in the top five of overall DUIs. We have ranked at or near the top for years. Drunk driving and fatal accidents are directly proportional. Please, let’s keep that out of our city. We rank at the top of the vehicular fatality list while Utah consistently comes in at number 50. When you consider that two-thirds of Utahans are Mormons who drink no alcohol it is easy to see why they don’t have problems with drunk driving. Anyone can see the correlation: drinking and driving leads to innocent people dying. There are many ways to grow our great city, but a tavern isn’t one of them. Do we really want to bring in an establishment that exists for the primary purpose of alcohol consumption, especially just a couple of hundred yards from our only University, especially in light of our new campus housing? The most alarming thing I heard during the meeting was when someone actually suggested that maybe some of these vehicular deaths were caused because people have to go to Spartanburg to go to a bar. She said that if these people could go to bars in Union, then they would have fewer miles to drive under the influence of alcohol (which, for the record, is a felony). If the best argument we can make is that it is better for citizens of Union to drive drunk for shorter distances than driving drunk from Spartanburg, then we really haven't come up with a good reason to pass this ordinance. A tavern on Main Street will not be a bright spot for our city. It will be a blight on our city. I applaud Tommy Anthony (District 1) and Ricky Todd Harris (District 4) for their opposition, and I respectfully ask the other members to join them and block this measure. The Protestant Reformation was a time of religious awakening around the world, giving rise to new denominations, new Bible translations, and new heroes to admire. It was an era characterized by a new boldness to attack the papacy, exposing powerful men for their corruption, and castigating the entire church, calling into question anything and everything that originated from the Vatican. Amid all the clamoring to present new interpretations to timeless Scripture were men with larger-than-life personalities who were often quick to vilify anyone with whom they disagreed. Many of these emerging scholars agreed with each other on the major tenets of the Reformation, but they would quibble over the minutia, evening questioning the salvation of their near-likeminded opponent. Two of these reformers who found themselves at odds with each other were Martin Luther and Ulrich Zwingli. Their main area of disagreement: the presence of Christ in the Lord’s Supper. Both men agreed that the mass needed improvement; for Zwingli, the Lord’s Supper should not be observed daily or weekly, for this had potential to “suffer loss of effectiveness by too frequent occurrence.” Luther took the position that the sacraments in and of themselves were insufficient to save, a position that put him at odds with the church. Where Luther and Zwingli sparred was on the question of presence—did the bread and wine literally become the body and blood of Jesus once they were administered? For Luther the answer was an emphatic yes; for Zwingli, it was just as emphatic in the negative. This may not seem like an important debate, but readers in the 21st Century need to keep this in context; as Ryrie noted, “It is worth pausing on this issue, because, abstract as it may appear, it was fundamental to early Protestants’ religious experience.” Believers observed the Eucharist so frequently that this issue could not be ignored. Luther was a gifted theologian whose mastery of the Greek language allowed him to correct translation errors in the Latin Vulgate. In his translating Luther “was able to perceive a certain arbitrariness in allegory. He thought of it as opposed to the literal sense of Scripture, which he wanted to explore through attention to grammar and the original texts.” His dispute with Zwingli, however, was not over a translation error, but in a question of to what extent the Lord’s plain words should be taken. His take on the presence of Christ in the sacraments is most easily seen at the colloquy at Marburg, a famed discourse between opposing parties that failed to reach an agreement. Beyond the words of Luther are his actions. If the bread and wine are actually the body and blood of the Savior, the Savior whom Luther dearly loved, then the elements themselves must be holy and cannot be mishandled. So in 1543 when some Communion wine was accidentally spilled on a woman, Luther went so far as to lick the wine from her coat, and “cut out the bits of the jacket they had been unable to clean, plane away the sections of her pew where the wine had splashed, and burn the lot.” This may seem like strange behavior, but it is fully consistent with Luther’s theology, and is the logical response to dealing with something as holy as the actual blood of Jesus. Luther knew that his critics said Jesus could not be the bread and wine because He is at the right hand of the Father, in accordance with Acts 2:32-33. This objection didn’t phase the Reformer, who taught that the doctrine of omnipresence applied just as much to Communion as it did to anything else. While Martin Luther garners much of the attention and praise from the Reformation, his opponent in this debate was no slouch. In addition to being highly educated himself, Zwingli was a reformed humanist who had a deep understanding of Scripture. It has been recounted that Zwingli, “overcome by the epistles of Peter…copied them by hand and committed them to memory.” He comes to this divergence with Luther able to hold his own. Zwingli rejected any form of transubstantiation. Yes, the actual words of Jesus are clear: “This is my body…this is my blood.” But are they to be interpreted in the most literal sense? Zwingli would say they are not. As proof he pointed to other “I am” statements from the Messiah, such as, “I am the door,” and “I am the vine (John 10:7, 15:5).” By Luther’s logic, one must also conclude that Jesus were an actual door and an actual vine, while simultaneously being the actual bread, all while being seated at the right hand of the Father. This was too much for Zwingli to take. Because of this position, Zwingli translated I Corinthians 11:24 to have Jesus say, “This signifies my body,” an interpretation he said came to him in a dream. Far from the stance of the Lutheran camp, the Zwinglians adopted the phrase, “spiritual eating” to refer to the sacraments (Luther countered this notion with physical eating). As a proof text Zwingli put forth John 6:63, which says, “It is the Spirit that giveth life; the flesh profiteth nothing: the words that I have spoken unto you are spirit, and are life.” From this verse “flesh availeth nothing” became a battle cry for Zwingli and his followers. 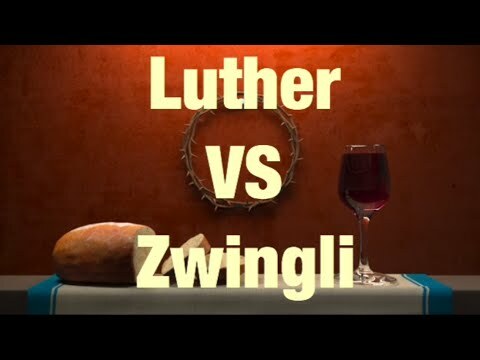 While the Eucharist was commonly thought of as a grace that brought salvation, Zwingli’s take has been summarized thusly: the bread and wine were reminders of a grace already received rather than vehicles of a present sacramental grace. Zwingli believed the ordinance served as an agent that should cause the believer to contemplate the crucifixion of Christ. Despite being only seven weeks apart in age, these men were worlds apart on this critical issue. Luther and Zwingli found themselves in an irreconcilable position, and because of their disagreement, neither man was fond of the other. On his Zurich foe, Luther wrote in Confessions Concerning Christ’s Supper, “I regard Zwingli as un-Christian, with all his teaching, for he holds and teaches no part of the Christian faith rightly. He is seven times worse than when he was a papist.” On his Wittenberg counterpart, Zwingli refused any association, wishing to be called Paulinian instead of Lutheran. After all, he quipped, he had been preaching Christ’s gospel “before any man in our region had so much as heard the name of Luther.” After their colloquy at Marburg, Zwingli attempted a brotherly embrace of Luther, but the latter coldly refused the gesture. Erickson went on to conclude, “We should think of the sacrament not so much in terms of Christ’s presence as in terms of his promise and the potential for a closer relationship with him.” That big picture approach may be the best way to balance the positions of Luther and Zwingli. It is this author’s opinion that Zwingli was closer to the truth, seeing the meal as similar to baptism, not something that is salvific, but a public testimony of a previous action. As in all things, balance is key. Luther championed the “Real Presence” of Christ in the Lord’s Supper, but some have swung too far, resulting in a “Real Absence” in their efforts to not be Lutheran. The communicant must see Christ in the bread and wine, but in a symbolic sense; otherwise, there is no point in taking Communion. Christ is there, because Christ is in the believer, and because the elements of the meal point back to Christ in a beautiful symbol of His horrific death.